MEF-CECP is positioned as a professional level, specialization certification within the MEF Professional Certification Framework. 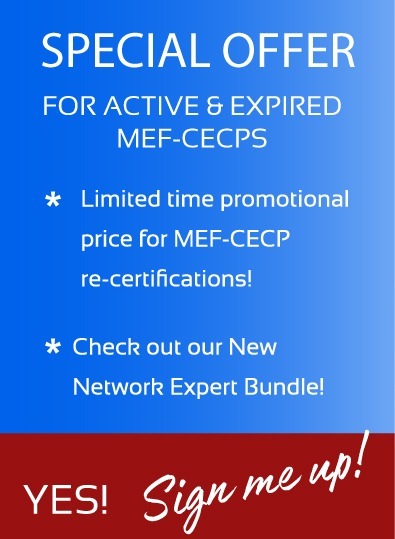 For the MEF-CECP Detailed Overview click here. For those who have already achieved this professional certification and need to re-certify, click here. Credential Awarded: MEF Carrier Ethernet Certified Professional (MEF-CECP). Valid for three years. Training & Study Available: MEF Accredited Training Providers (MEF-ATP’s) offer training course and certification exams on a global basis. Click here for a list of MEF-ATPs and additional information.